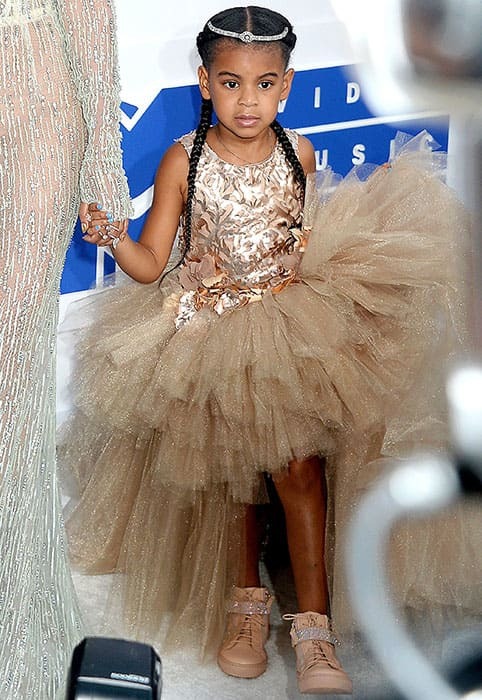 Beyonce and daughter Blue Ivy wore stunning dresses on VMAs red carpet | HELLO! August 29, 2016 - 15:17 BST hellomagazine.com Little Blue Ivy Carter stole the show at the MTV VMA music awards last night after attending her first ever red carpet. Like mother like daughter! Little Blue Ivy Carter stole the show at the MTV VMA music awards last night after attending her first ever red carpet. The four-year-old wore an incredible tutu-style gown as she held hands with her mother on the red carpet, while Beyonce dazzled in an embellished white Francesco Scognamiglio gown with feathered oversized wings. 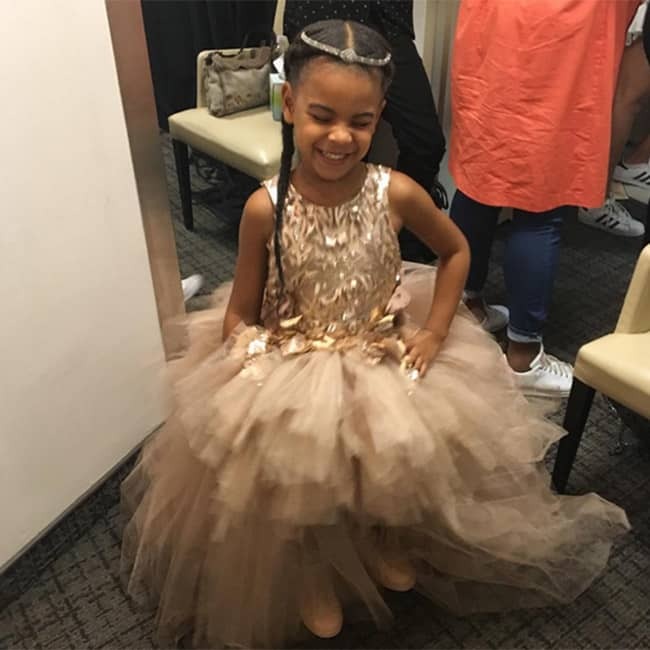 According to reports, little Blue Ivy's metallic, glittery dress with a long tutu train, ornately embellished bodice and flowery waist is worth an incredible $11k (£8,300) and was made by children's designer Mischka Aoki at Bergdorf Goodman. Beyonce shared several snaps of them before their red carpet debut on her Instagram page. In one photo the pair of posing for the camera with Blue Ivy's train fanned out in front of her mother's stunning outfit, while another shows Blue Ivy grinning with her hand on her hip in a candid moment. The third photo of the adorable mother and daughter combo is a birds eye shot of them watching down the red carpet, revealing their gorgeous hair braids. Fans of the star were quick to voice their praise for the fantastic mother and daughter red carpet looks, with one writing: "Roses are red. Violets are blue. Beyoncé and Blue are better than you," while another wrote: "Beyoncé and Blue Ivy are the cutest mother-daughter duo…the Vma red carpet pics are adorable." Beyonce wowed at the awards show on Saturday night after performing a 15-minute act. The star also won a total of eight awards after receiving 11 nominations, including the much coveted 'Video of the Year' award for Formation.